Ringo is an almost 2-year-old black female born May 3, 2013. Her sire is Knock Out and her dam is El Parish. 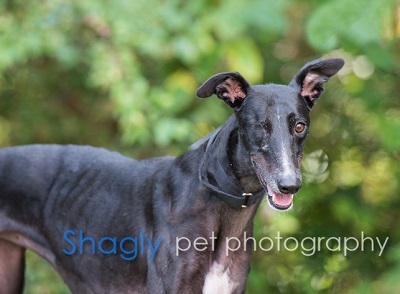 Ringo is blind in one eye, was not individually registered, and has not raced. Ringo likes having extra time to explore her environment due to her blind eye, but she's warming up to our TLC volunteers. When Ringo was spayed, the veterinarian also removed the remaining eye tissue from her blind eye and closed it up. Ringo has passed an initial cat test, but has not yet lived with cats. Ringo's left rear leg presented as being a little swollen on Monday, August 3. She was taken to VCA Preston Park Animal Hospital under the care of Dr. Christy Soileau and Dr. Jeff Ellis. A physical examination and x-rays showed nothing to account for the swelling. Because the swelling continued at a very fast pace, Ringo was transferred to VCA Animal Diagnostic Clinic where she received an ultrasound which indicated lots of pooling blood and an aspirate showed the presence of pus. She was immediately transferred to Dallas Veterinary Surgical Center to have drains surgically placed; however before that could happen the leg ruptured leaving an open wound around her hip area about the size of a tennis ball. Ringo is being monitored very closely with daily bandage changes. There is a lot of necrotic tissue and there is no known cause of this infection - no open wounds, etc. It possibly was started by a foreign body, which could be the size of a grass thorn. At this time we just do not know. We do know that Ringo's medical condition is very critical at this time. Ringo’s stitches have been removed and all is healed up. She is feeling and acting better than ever. This girl is ready to find her forever home! The special medical treatment cost needed by Ringo is why the Miss Mesa Fund was established. If you would like to help with Ringo's care, please take a moment to make a donation to the fund. 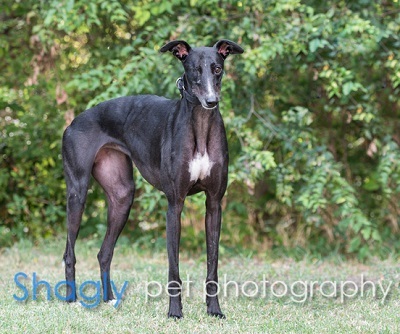 You WILL and CAN make a difference in Ringo's life and the lives of other greyhounds in need of special medical care. Your help and support will make a difference - one greyhound at a time. Please note Miss Mesa Fund/Ringo on your check. Ringo is an energetic young girl who loves the outdoors. Her dream day would be to run some zoomies, nap in the grass, gnaw on a bone, and chase some squirrels. She likes to take all of her toys outside. So far I haven’t been able to teach her to bring them back inside! She does enjoy a soft bed and sleeps all night. She has the run of the house and has been accident free. She walks well on a leash with no pulling and enjoys walking. It is not known how she lost her eye, but she gets on quite well without it and can spot a squirrel a block away. She is devoted to her foster brother and takes her cues from him. She is a little shy with people but is getting more and more used to meeting new people. She has not been tested with cats or small dogs yet but she is not bunny friendly. Ringo is good-natured, sweet, affectionate, and a pleasure to have around.